Nearly all the villas in Phuket are seaview villas in the hills above the beaches. There are just a few Phuket villas with direct access on the beachfront. Combining traditional Thai architecture with it's chic style & contemporary art collection, fantastic private chef, looking out to sea from the cliff edge. Unique & captivating. Incredible 4 bedroom private pool villa, a spectacular home with expansive pool, gym, and panoramic ocean views of the coastline and far off islands. 5 bedroom brand new villa overlooking the turquoise bay with many large & fun outdoor spaces interacting with the indoor day areas. Nestled in the hill above the beach, this 6 bedroom luxury villa is an incredible private escape with spectacular sea views over the Andaman. An enchanting 3 bedroom villa featuring a delightful private infinity pool and beautiful views of the Andaman Sea in stunning Kamala. 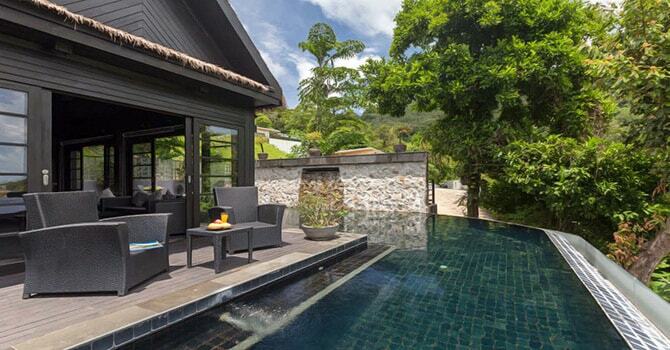 Phuket Luxury Villas make a great holiday option. Offering you your own private villa holiday space, private pool, staff, chef and all modern facilities like your own fitness, cinema and games rooms, as well as spa, steam and sauna rooms. There are a large range of villas for rent. Even if a villa is large with eight bedrooms they will offer you to use less bedrooms and pay less per night. So you can often rent a larger villa with staff and all its amenities but only use a few bedrooms and pay much less per night. Prices vary between seasons and are highest over the peak season of Christmas and New year in Thailand. There are a range of private villas for rent in Phuket which are able to accommodate different group sizes. But first a little advice. A villa can have a different number of bedrooms to your group requirements. Often they will allow you to use a specific number of bedrooms at a different price. You still get to use all the villa amenities. We show the bedroom ranges they allow you to open in our search results. Then all you have to do is go to the bottom of our villa details pages to find out the different pricing. And don’t worry, you won’t miss an opportunity - we list our villas in all the bedroom ranges that they accommodate. So all you have to do is choose the number of bedrooms you need below and you will see all the villas available to your group. But first a little advice. A villa can have a different number of bedrooms to your group requirements. 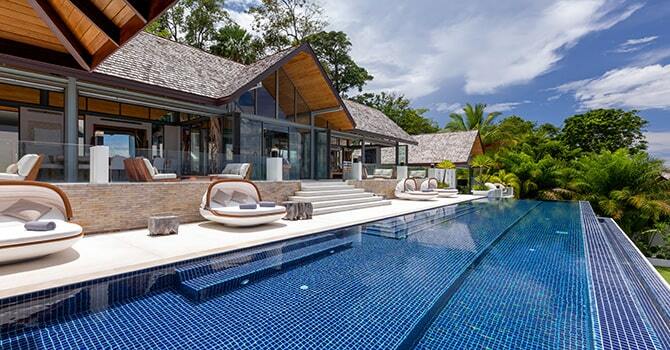 These villas make for a great family villa holiday in Phuket. The most common category is 5,6,7 bedroom villas Phuket offering the largest flexibility in group numbers. Remember that these villas may allow you to use less bedrooms and pay less too. Nearly all have a cinema, games and fitness room. Finally there are the large luxury villas with expansive space and amenities. These 8,9,10 > bedroom villas offer large spaces with many different indoor and outdoor areas for large groups. One of the biggest attractions of renting your own villa is the level of service and attention. There will be a villa manager to tend to your every need. Shopping, transportation, excursion or restaurant bookings. They are your personal concierge. Then there is the housekeeping staff and your personal full-time chef in most villas.Daily breakfast is usually included, if you want to have a barbecue or luncheon at the villa then all you have to do is ask them to make the arrangements. 1.Phuket Seaview villas are nestled in the hills above its many beautiful beaches offering complete privacy and panoramic views over the turquoise waters of the Andaman sea. 2.Phuket beachfront villas offer direct access to enjoy the sea and beach surrounds. Unlike Koh Samui there are not many of these beach villas in Phuket and so forward planning is needed to secure availability. There are also Phuket Villas to suit all groups for your next villa vacation. There are many large beautiful properties that can be the wedding villa for your special day.We can liaise with wedding planners to make sure all goes to plan. 4.There are even very large individual villas or multiple properties next to each other which can be rented out together making them perfect phuket villas for large groups or corporate events. As the Villa marketing company with the widest choice of luxury villas in Phuket we have analysed our 2018 data. This has enabled us to release this up-to-date survey of the average cost of renting a villa in Phuket to give a guide for 2019. These are statistical averages and of course you can find great low season deals on villas or rent the most expensive & luxurious villa on the island. And time of year will change the cost due to the difference between peak, high and low seasons. We present here the average cost by analysing our data across all villa sizes over the last year. So the average cost is USD$115 a night per person in the group. Most villas ask for a minimum number of nights stay to be able to make any booking. This is typically 3 nights throughout the year although in high season this can increase to 5 or 7, and even 10 nights in peak season. At the bottom of our villa details pages we show the minimum nights required at the different times of the year. Private villas work similarly to hotels so the check-in is usually in the afternoon and check-out is by late morning or midday. Each villa is different so please ask us. All our inquiries through the website go direct to the Owner. Once you make an inquiry our concierge service will contact you to work through your plans and provide a full range of villa options available. Yes, luxury villas offer you the flexibility to rent different numbers of bedrooms at different prices. And you still get to use the entire villa and its facilities plus the service of all the staff. most and we will provide you a list of all the available villas that have a bedroom configuration that works best for your group and requirements. for your stay then please discuss your requirements with us so that we can provide you with the best possible options. We are here to make your luxury villa holiday in Phuket as convenient and easy as possible. If you are interested in choosing from a few villas that match your group requirements then planning early is necessary. Often people book luxury villas for the next year at the end of their stay and all villas are booked early in the year for the Christmas and New Year periods. Planning and booking well in advance will give you the most villas to choose from. Well right here is where you can find them. We represent all the best villas in Phuket and they come with every amenity you can imagine. Whether you want a playground villa with a bowling alley and putting green or you are looking for a private luxury retreat we have it all. Just get ready to have the best time on your next villa vacation in Phuket. Well you are here so you have found it. We offer all of Phuket’s best private villa rentals. You can sort them by number of bedrooms, location, price and type. This should help you make the search for your next trip as easy as possible. And by the way, they really are incredible luxury villas. Our concierge staff will be happy to learn about your preferences and group profile and provide a list of the very best luxury villas in Phuket. This will save you lots of time and research as we will only present the villas for rent that suit and are available. 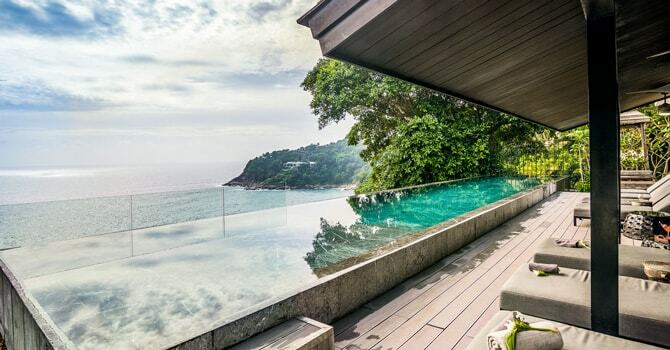 Where are the Best Villas in Phuket? 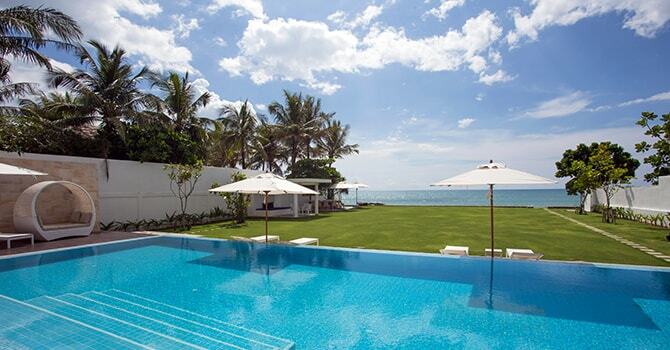 There are very popular beaches on the west coast with many beautiful luxury villas in Phuket. 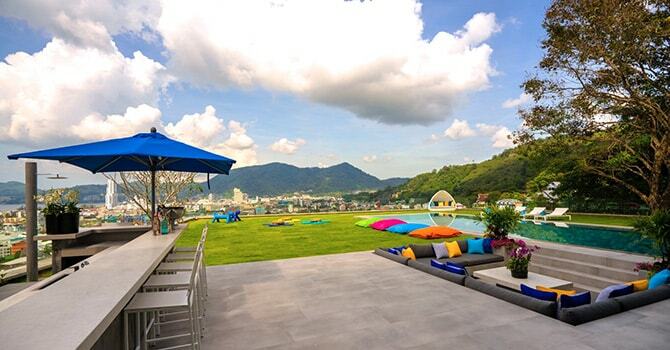 A popular destination with beach dining and shopping and not far from the main entertainment district Patong. The newly opened Cafe Del Mar beach club is located here. Kamala’s luxury villas are nestled in the hills above the beach. A quiet beach just north of Laguna and its Golf club. Villas sit on top of the cliff and in the hills above the beach. Surin is known as 'Millionaire’s Row' with it’s many top end resorts and luxury villas. The private villas sit on prime spots on top of the hill overlooking the white sand and turquoise waters below. Ao Sane beach is directly beside Nai harn. Imagine that you could rent the only villa nestled in a bay’s hill, with a few steps leading down to the beach. The beach is known to be one of the safest and best beaches for swimming and snorkelling on the island. Possibly one of the most private villas in Phuket, explore 9 bedroom Villa Thousand Hills which sleeps up to 22. A piece of old Thailand in this secluded & quiet bay in Phuket's south. There are only a few villas here but possibly the best on the island. On the east of the island looking out to Phang Nga, the villas for rent are super luxury and beachfront.